The movement around a new approach to business that puts people and planet at the centre, alongside profit, is picking up momentum. Virgin Unite, founded by Richard Branson, is always on the hunt for catalysts to help speed this movement up, and the new book “Collaborative Capitalism and the Rise of Impact Investing” is a great example of one of those catalysts. The beauty of the book is that is takes a holistic look at a new way of doing business and shows that the movement is far larger and more important than ever before – putting collaboration, wisdom and empathy back at the heart of capitalism. Collaborative Capitalism and the Rise of Impact Investing demonstrates that business and investing are transforming – for the better. A must read for those interested in how the field is evolving. Investing with the explicit goal of creating financial returns alongside measurable social and environmental benefits is catching fire. Wall Street’s biggest players are rushing to provide clients with access to new impact investing options, amid growing consumer demand and evidence that the approach can be successfully executed. Recent research on outstanding impact investing funds has revealed a mature practice, vibrant with commercial investors, providing stable, predictable returns to their investors as well as supporting the creation of millions of jobs and other tangible outcomes in markets overlooked by traditional asset managers. And yet, the individuals and organizations committed to impact investing are just the tip of the iceberg in a larger movement. This includes the growing field of social enterprise, where market-based solutions can go beyond what government and philanthropy can do to directly address society’s problems. And it includes institutional investors who have utilized impact screens and shareholder activism as a risk reduction strategy over the past 30 years. 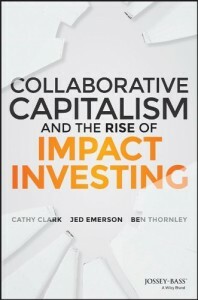 Collaborative Capitalism and the Rise of Impact Investing sees these movements as signs of a much more fundamental shift, as finance as a whole responds to an increased consumer demand for market transparency—the need to know exactly what we are buying, where and how it was made, and who it affects. 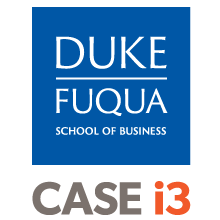 By putting a lens on the underlying practices that bridge impact investing and risk mitigation finance, the book outlines the transformation in finance itself, driven by more cross-sector, transparent relationships in the service of creating long-term value for multiple stakeholders, not just shareholders. Available on Amazon: The Impact Investor: Lessons in Leadership and Strategy for Collaborative Capitalism. We are happy to discuss speaking engagements, and private orders of the ebook, both in print and electronic versions, and can customize the presentation of it for your audience. Please contact us.